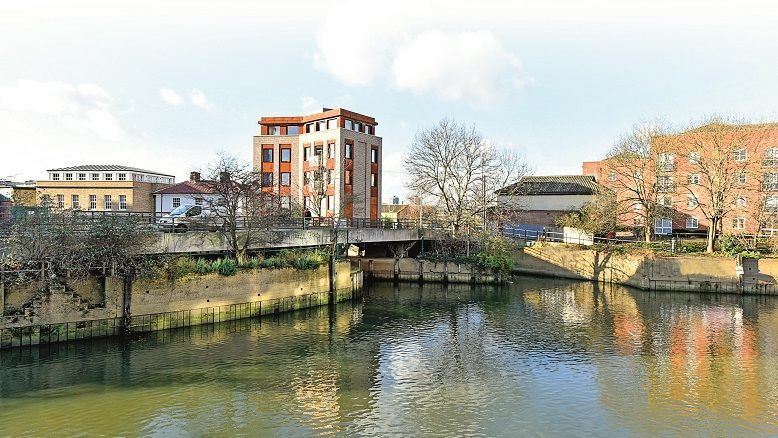 City Mill Lock Island – a small man-made structure housing a working lock on the Bow Back Waters at Stratford, has been transformed by a new residential development designed and delivered by Architect and Developer Roberts & Treguer. Known as Blaker Island, the development is formed of two new Cross Laminated Timber (CLT) buildings built either side of a Listed and refurbished 1930’s lock keepers house. The two new buildings, Howards House and The Warehouse – a five storey apartment block, have been designed to passivhaus standard and provide seven spacious, modern homes with views over the Olympic Park and surrounding waterways. The new buildings are built from Stora Enso PEFC certified Cross Laminated Timber which has helped to meet the high level of airtightness required for Passivhaus. Other key considerations for the specification of CLT include its ability to resolve limitations presented by the island site in terms of weight and access, possible only via a small foot bridge. Specialist hybrid construction firm, G-frame Structures, who supplied and installed the CLT, devised an innovative installation strategy to overcome the complex site logistics which enabled them to safely and efficiently deliver both superstructures in just six weeks. Roberts and Treguer’s design concept for the development was driven by a desire to provide high quality, low energy homes that would be completely different to anything else available in the area. “From the outset a key part of our design intent was to build highly sustainable and energy efficient homes that would meet passivhaus standards and CLT has helped us to achieve this due to its high airtightness qualities.” Explains Bachir Nebia, Contracts Manager at Roberts & Treguer. Airtightness details for Howard’s House and the Warehouse are designed to 0.6 ACH (air change) which is the maximum allowed for achieving Passivhaus standard. Windows are triple glazed and junction detailing between window and CLT wall panels has been carefully considered. Energy efficiency is further improved by a compact unit in each dwelling which combines MVHR with an air source heat pump to provide ventilation, heating and hot water. It is estimated that over a 60 year period a typical dwelling will save 192 tonnes of CO2 compared with a typical UK home. Weight was also a key consideration in the specification of CLT: “We were going to be adding a lot of weight to an existing structure and this was a key factor in the material specification. The island has river walls all around it which are owned by the Canal Trust and we carefully considered the potential impact on them of increased weight.” Says Bachir. “CLT is a more lightweight structural material than traditional construction materials and this enabled the project team to reduce the weight of the superstructure while still creating spacious, sustainable and energy efficient homes. We worked closely with G-frame Structures and timber engineer Furness Partnership on the detail design and the G-frame team developed quick and efficient solutions for the crane and installation strategy.” He continues. These factors were key considerations for the structural design and CLT panels were specified to be liftable by the IG050 mini crane. Brick slip cladding further contributed to achieving a lighter overall weight for the buildings as well as allowing for walls to be formed from the CLT wall panel, insulation and cladding without dramatically increasing thickness. The site layout also required the development of a cantilevered section at the corner of the Warehouse building to avoid the foundations of the foot bridge which are located close by. This was resolved by the introduction of Glulam beams integrated to the open façade and incorporating step-in level access to the bridge for servicing the building. Sound separation at the Warehouse was achieved by the use of double-layer CLT walls around the full height central core which houses the lift shaft and staircase. The two walls are separated by only a 90 mm space and to overcome the inaccessible nature of this element of construction, G-frame Structures used discreet connections which also contributed to the overall aesthetic of the building. Externally the development presents a varied streetscape and Roberts & Treguer have taken care to reflect the history of the Island and surrounding waterways. Though having the external appearance of one single house, Howard’s House is comprised of two spacious three bedroom homes. The design is based on the original home of the 19th Century chemist and amateur meteorologist Luke Howard which was originally situated on the island but demolished in 1934. Howard is known as the ‘Namer of Clouds’ for having developed the nomenclature system for cloud classification which is still used today. Inspiration for the adjacent five storey block of flats, known as The Warehouse, is taken from the local vernacular of traditional warehouses to be found on the rivers and canals of Stratford. The Warehouse is very generously proportioned with just one three bedroom apartment on each of the ground, first and second floors and a two bedroom penthouse on the third and fourth floors. Bedrooms and large open plan kitchen/living spaces lead from a central hallway where the MVHR unit is located so that humid air can be extracted from the kitchen and bathroom and fresh air supplied to the bedrooms. The building features a recessed roof garden which has been achieved by an innovative solution developed by G-frame Structures and Furness Partnership whereby the beams effectively act as a cradle for the floor which hangs beneath. Internally, all the new homes feature exposed CLT throughout with accent provided by a simple monochrome palette which contrasts well with the texture and colour of the wood. All homes on Blaker Island were sold on first viewing.